The DY-100 class was an early design of Earth space vessels that were in operation during the late 20th century. The ships were especially designed for interplanetary travel. They had simple nuclear powered engines and were equipped with artificial gravity. They utilized transistors as components. DY-100 ships were launched into orbit with booster rockets. In the 1990s, this class of spaceship was considered to be one of the most advanced. At least some of the DY-100 ships were sleeper ships. In those a crew of at least 85 could be placed into suspended animation inside life support canisters prior to liftoff. The life support of the ship was turned off for the journey. The use of suspended animation was necessary up to approximately 2018, as it took years to travel from planet to planet in the solar system prior to that. All of the DY-100 ships were probably not sleeper ships, as the crew of the Enterprise was surprised to discover the Botany Bay to be one. That contradicts a bit with the computer display of VOY: "Drone", where the image of the ship is specifically labelled "DY-100 Sleeper Ship" (though the graphic might specifically refer to the Botany Bay). It is stated in the reference book Star Trek Chronology that significant improvements in sub-light propulsion technology led to abandoning of DY-100 ships. The original version of "The Ultimate Computer" featured a DY-100 class Woden as a Federation freighter. This appearance would indicate some of these ships were adapted into service by the Federation and remained in use at least as far as the 23rd century. Due to the retcon of the remastered version, it is impossible to determine if this was the case. 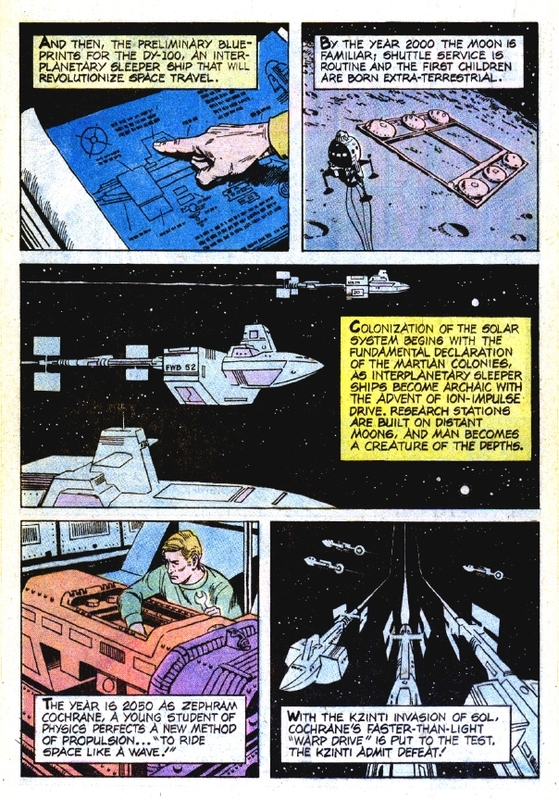 Memory Alpha lists the Woden as an Antares-type starship, for the sole reason it was a more recent appearance from the production point-of view. In Star Trek Spaceflight Chronology, it is stated that DY-100 was the first mass-produced spaceship of Earth. This production began in 1996. There were cargo, fuel and passenger containers the ship could carry. In the standard configuration, it was used between Earth and Luna. In an uprated mode, it was able to take man to Mars. A journey to Mars, when the suspended animation was used, took 937 days. In the Spaceflight Chronology, timeline specifications are given of an SS Copernicus of the DY-100 class. It served from 1995 to 2020. Specifications were length 100 meters, weight 2.72 million kilograms, ship's complement 22, and chemical/fission propulsion. Only the overall shape is similar to the Botany Bay. The Copernicus is probably intended to be the prototype of the class. Unlike the Botany Bay, the Copernicus had a built-in engine pack of six chemical boosters for lift-off. There is a discrepancy with the text and graphics, as the graphics show only four boosters. The DY-100 was designed by Matt Jefferies. In sketches, it was referred to as an "obsolete tramp space freighter" or an "antique space-freighter". In fact, Jefferies once stated, in 1968, "The Botany Bay was actually designed before the Enterprise. It was a little idea that popped up and was labeled 'antique space-freighter'. Later on, we made it look like something else – a vehicle from the early 2000s. (Inside Star Trek, issue 4, p. 4) One sketch also included the numbers 418 on the hull of the ship. Jefferies was pleased with the notion of modular shipping crates that could be automatically loaded and unloaded without requiring Humans to venture into space. In the sketches, Jefferies envisioned that three additional cargo containers could be attached to complete the middle section arrangement. In fact, judging from the actual model, it appears that even a second set of containers could be attached behind the first. (The Art of Star Trek) In the original script of TOS: "Space Seed", dated 26 October 1966, this class was called "CZ-100" and almost perpetuated into the final script. In effect, author James Blish, forced to work from non-final script drafts at the time, had to adhere to the "CZ-100" designation in a 1968 novelization of the episode, which he wrote, indicating that the class change had been a late decision. Jefferies sold off his original design sketches on 12 December 2001 in Profiles in History's The Star Trek Auction, in order to raise funds for the charitable organization "Motion Picture and Television Fund". The studio model of the DY-100 class, measuring 43×18 (aft section) inches, was mostly constructed out of wood, as was usual in that era, embellished with miscellaneous model kit parts and metal components. The leading edge of the "sail" (a naval term for the tower structure found on most submarines) features a corrugated metal foil and the engine pod includes metal "antennas" and masts. The model was not internally lighted and was finished in a brown/red-gray hue, though that finish was washed out into an overall gray on screen, due to bright lighting conditions in the studio and the use of the blue-screen filming technique causing light to bounce off the screen onto the model, an effect known as "blue spill". While not built by Jefferies, he did add the weathering on the model. Upon completion, the model was sent to Linwood G. Dunn's Film Effects of Hollywood, where the only footage of the model was shot, its one later appearance as the Woden in the original airing of TOS: "The Ultimate Computer" being stock footage of that shoot. (Cinefantastique, Vol. 27, No. 11/12, pp. 70-71) In the 2006 remastered version of the episode, the footage of the Woden was replaced by a newly constructed CGI model. The table-top model – smaller than the original and outfitted with booster rockets, used in the post-TOS references, first appearing in a Photoshopped launch photograph in Star Trek Chronology and subsequently in Star Trek Encyclopedia – was built by Greg Jein. (Star Trek Encyclopedia (3rd ed., p. 52)) The launch photo made subsequent in-universe appearances as a wall ornament in the episodes ENT: "First Flight", "Home", and VOY: "Future's End", the latter of which also featured the model itself as a desktop model in Rain Robinson's office. The (framed) photograph itself, part of a set of four, was offered up for auction as Lot 193, in the 40 Years of Star Trek: The Collection auction, estimated at US$200-$300, and was eventually sold on 5 October 2006, with a winning bid of US$3,000 (US$3,600 including buyer's premium). Previously, in 2003, Doug Drexler had already built a CGI model of a DY-100 class vessel for a fan film in the Star Trek: New Voyages series. His model was later used for licensed Star Trek: Ships of the Line calendars and a book derivative of those publications. (X) A new CGI model was built by former Foundation Imaging employee Jose Perez in 2004 for a "Fleet File" article in Star Trek: Communicator issue 148 (pp. 62-65).